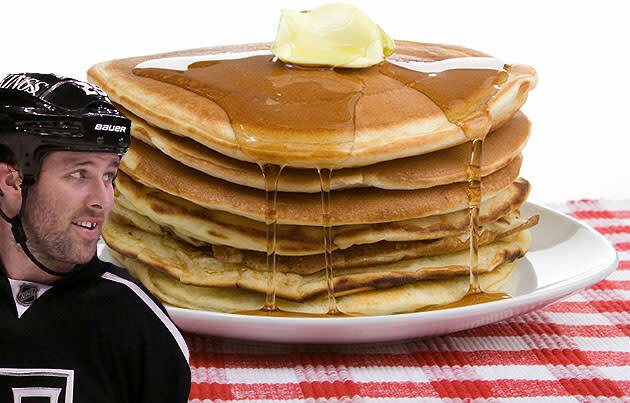 Things an NHL player shouldn't do when his weight and conditioning are constant points of contention and ridicule: Suffer an injury while eating a stack of "delicious pancakes." "I woke up fine, sat down to eat and it locked right up. It never happened to me before. I couldn't stand up. I was probably at the third stage of evolution. So my wife helped me get dressed, and then I drove to the rink here, to hope they could do some magic and get it opened up. Kinger [trainer Chris Kingsley] just looked at me and said, 'Go home.' So I got some treatment and went home. "Apparently it's one of those mysterious things, where you can throw it out (from) sneezing. I just leaned over to dip into some delicious pancakes that my wife made. It's just like it [the pain] wraps around you and squeezes. … So it was disappointing. Hopefully it's just an isolated incident, and not something that's going to become chronic." The evolution joke makes us think Penner can have a laugh about this stuff; obviously, we don't want to see a guy already struggling through this season suffer through a back injury. Not to get too syrupy here, but we're rooting for the guy, even though the odds are stacked against him. Penner was a good player while he was in Edmonton, even as he drove some crazy with his seemingly languid style of play. I saw him as a smart but lumbering player, not a lazy bones. If he gets healthy, he can help the Kings. Credit to Penner for telling the truth about how he got injured in this case, as he had to know his critics would feast on such an anecdote. As Staples notes, and as so many of us are painfully familiar with, back injuries can occur through the simplest of activities: Getting out of bed, tying one's shoes, lifting a child. Or eating a plate of pancakes. We eagerly anticipate Dustin Penner's public safety video to be shown at all Los Angeles area IHOPs about the dangers of pancake consumption.